When building applications in a microservice architecture, managing state becomes a distributed systems problem. Instead of being able to manage state as transactions inside the boundaries of a single monolithic application, a microservice must be able to manage consistency using transactions that are distributed across a network of many different applications and databases. In this article we will explore the problems of data consistency and high availability in microservices. We will start by taking a look at some of the important concepts and themes behind handling data consistency in distributed systems. Throughout this article we will use a reference application of an online store that is built with microservices using Spring Boot and Spring Cloud. We’ll then look at how to use reactive streams with Project Reactor to implement event sourcing in a microservice architecture. Finally, we’ll use Docker and Maven to build, run, and orchestrate the multi-container reference application. When building microservices, we are forced to start reasoning about state in an architecture where data is eventually consistent. This is because each microservice exclusively exposes resources from a database that it owns. Further, each of these databases would be configured for high availability, with different consistency guarantees for each type of database. Eventual consistency is a model that is used to describe some operations on data in a distributed system—where state is replicated and stored across multiple nodes of a network. Typically, eventual consistency is talked about when running a database in high availability mode, where replicas are maintained by coordinating writes between multiple nodes of a database cluster. The challenge of the database cluster is that writes must be coordinated to all replicas in the exact order that they were received. When this happens, each replica is considered to be eventually consistent—that the state of all replicas are guaranteed to converge towards a consistent state at some point in the future. When first building microservices, eventual consistency is a frequent point of contention between developers, DBAs, and architects. The head scratching starts to occur more frequently when the architecture design discussions begin to turn to the topic of data and handling state in a distributed system. The head scratching usually boils down to one question. How can we guarantee high availability while also guaranteeing data consistency? To answer this question we need to understand how to best handle transactions in a distributed system. It just so happens that most distributed databases have this problem nailed down with a healthy helping of science. Mostly all databases today support some form of high availability clustering. Most database products will provide a list of easy to understand guarantees about a system’s consistency model. A first step to achieving safety guarantees for stronger consistency models is to maintain an ordered log of database transactions. This approach is pretty simple in theory. A transaction log is an ordered record of all updates that were transacted by the database. When transactions are replayed in the exact order they were recorded, an exact replica of a database can be generated. The diagram above represents three databases in a cluster that are replicating data using a shared transaction log. The zipper labeled Primary is the authority in this case and has the most current view of the database. The difference between the zippers represent the consistency of each replica, and as the transactions are replayed, each replica converges to a consistent state with the Primary. The basic idea here is that with eventual consistency, all zippers will eventually be zipped all the way up. Let’s do an overview of the problem we will solve as a part of our sample application. The problem we’re going to solve is how to discover communities of influencers on Twitter using a set of seed profiles as inputs. To solve this problem without a background in machine learning or social network analytics might be a bit of a stretch, but we’re going to take a stab at it using a little bit of computer science history. The PageRank algorithm, created by Google co-founder Larry Page, was first used by Google to rank website documents from analyzing the graph of backlinks between sites. I dug up the original research paper on PageRank from Stanford for some inspiration. In the paper, the authors talk about the notion of approximating the "importance" of an academic publication by weighting the value of its citations. The reason that PageRank is interesting is that there are many cases where simple citation counting does not correspond to our common sense notion of importance. For example, if a webpage has a link to the Yahoo home page, it may be just one link but it is a very important one. This page should be ranked higher than many pages with more links but from obscure places. PageRank is an attempt to see how good an approximation to "importance" can be obtained just from the link structure. Now let’s take the same definition that is described in the paper and apply it to our problem of discovering important profiles on Twitter. Twitter users typically follow other users to track their updates as a part of their stream. We can use the same reasoning behind using PageRank on citations to approximate the "importance" of profiles on Twitter. This reasoning would tell us that it’s not the number of followers that make a profile important, it is measured by how important those followers are. That’s exactly what we’re going to build in this article, and we’ll end up with something that looks like the following table. The first thing we’re going to need to worry about when building this solution is how we’re going to calculate PageRank on potentially millions of users and links. To do this, we’re going to use something called a graph processing platform. What is a graph processing platform? A graph processing platform is an application architecture that provides a general-purpose job scheduling interface for analyzing graphs. The application we’ll build will make use of a graph processing platform to analyze and rank communities of users on Twitter. For this we’ll use Neo4j Mazerunner, an open source project that I started that connects Neo4j’s database server to Apache Spark. The diagram below illustrates a graph processing platform similar to Neo4j Mazerunner. The graph processing platform I’ve described will provide us with a general purpose API for submitting PageRank jobs to Apache Spark’s GraphX module from Neo4j. The PageRank results from GraphX will be automatically applied back to Neo4j without any additional work to manually handle data loading. The workflow for this is extremely simple for our purposes. From a backend service we will only need to make a simple HTTP request to Neo4j to begin a PageRank job. I’ve also taken care of making sure that the graph processing platform is easily deployable to a cloud provider using Docker containers. In a previous article, I describe how to use Docker Compose to run Mazerunner as a multi-container application. We’ll do the same for this sample application but extend the Docker Compose file to include additional Spring Boot applications that will become our backend microservices. By default, Docker Compose will orchestrate containers on a single virtual machine. If we were to build a truly fault tolerant and resilient cloud-based application, we’d need to be sure to scale our system to multiple virtual machines using a cloud platform. This is the subject of a later article. 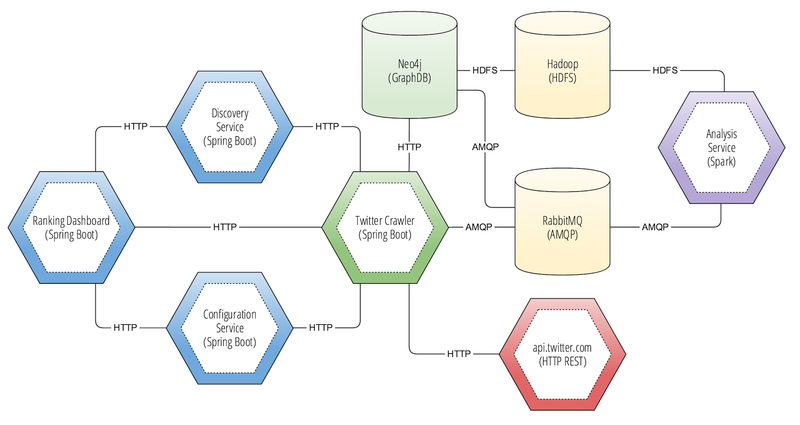 Now that we understand how we will use a graph processing platform, let’s talk about how to build a microservice architecture using Spring Boot and Spring Cloud to rank profiles on Twitter. I’ve talked a lot about microservices in past articles. When we talk about microservices we are talking about developing software in the context of continuous delivery. Microservices are not just smaller services that scale horizontally. When we talk about microservices, we are talking about being able to create applications that are the product of many teams delivering continuously in independent release cycles. Josh Long and I describe at length how to untangle the patterns of building and operating JVM-based microservices in O’Reilly’s Cloud Native Java. In this sample, we’ll build 4 microservices, each as a Spring Boot application. If we were to build this architecture as microservices in an authentic scenario, each microservice would be owned and managed by a different team. This is an important differentiation in this new practice, as there is much confusion around what a microservice is and what it is not. A microservice is not just a distributed system of small services. The practice of building microservices should never be without the discipline of continuous delivery. For the purposes of this article, we’ll focus on scenarios that help us gain experience and familiarity with building distributed systems that resemble a microservice architecture. Now let’s do a quick overview of the concepts we’re going to cover as a part of this sample application. We will apply the same recipe from previous articles on similar topics for building microservices with Spring Boot and Spring Cloud. The key difference from my previous articles is that we are going to create a data service that does both batch processing tasks as well as exposing data as HTTP resources to API consumers. The diagram below shows each component and microservice that we will create as a part of this sample application. Notice how we’re connecting the Spring Boot applications to the graph processing platform we looked at earlier. Also, notice the connections between the services, these connections define communication points between each service and what protocol is used. The three applications that are colored in blue are stateless services. Stateless services will not attach a persistent backing service or need to worry about managing state locally. The application that is colored in green is the Twitter Crawler service. Components that are colored in green will typically have an attached backing service. These backing services are responsible for managing state locally, and will either persist state to disk or in-memory. This series continues from the last blog post about building microservices using Spring Cloud. This post has two parts. The first part describes how to create cloud-native data services using Spring Boot. The second part is a companion example project that uses Docker Compose to run multiple microservices locally to simulate a polyglot persistence setup. Polyglot persistence is a term that describes an architecture that uses a collection of different database solutions as a part of a platform’s core design. More plainly, each backing service is managed from an exclusive connection to a Spring Boot service that exposes domain data as HTTP resources. The central idea behind polyglot persistence is that service architectures should be able to utilize the best languages for the job at hand. There is no clear definition of how to do this well, and it tends to evolve organically as central databases become cumbersome when required to add new features. When designing microservices that manage exclusive access to multiple data providers, it can be useful to think about the roles in which your microservices will play. We can think of a Spring Boot application as the basic building block for our microservice architecture. The diagram above describes six Spring Boot applications that are color coded to describe the role they play when integrated using Spring Cloud. Each Spring Boot application in a microservices architecture will play a role to varying degrees of importance. The data service role is one of the most important roles in any setup. This role handles exposing the application’s domain data to other microservices in the platform. The diagram below describes an example microservice architecture with multiple Spring Boot applications that expose data from multiple database providers.